The necklace I made today is called Kaeru no Uta, which, in Japanese, means "Frog Song". 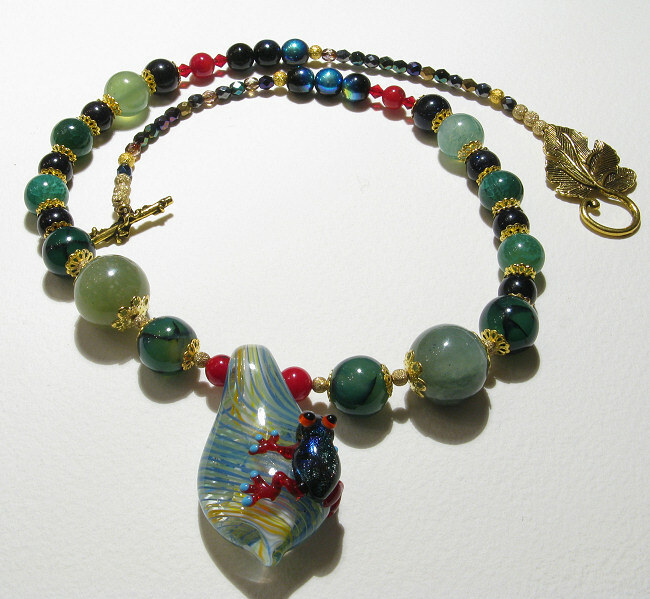 I made it mostly because my Mother LOVES frogs, and I managed to put my hands on some really lovely Chinese lampwork pendant beads, with super-cute frogs over a leaf. They are very delicate though, and should be handled with extra care. Frogs are also linked to the Summer, and the rainy season in Japan. 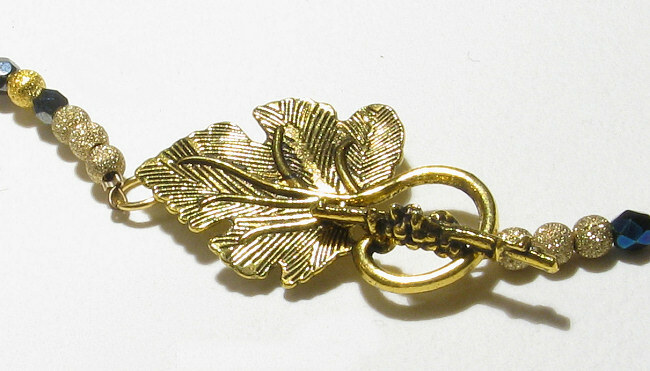 - Antique gold bead caps and clasp in the shape of a leaf. On the 1st picture a detail of the lampwork pendant. Note the back of the frog has some gold foil speckles, very pretty and delicate. His tiny toenails are painted blue, which may be the tendency for Spring-Summer, no? You can also see the two small Red Sea coral beads that I used as an accent. 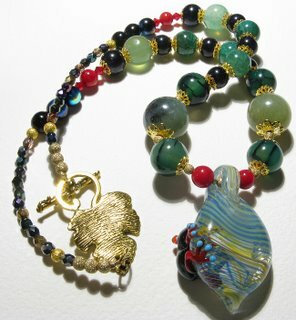 Between them, I placed two stardust balls, in order to support the pendant and cover the wire. But they are not visible. 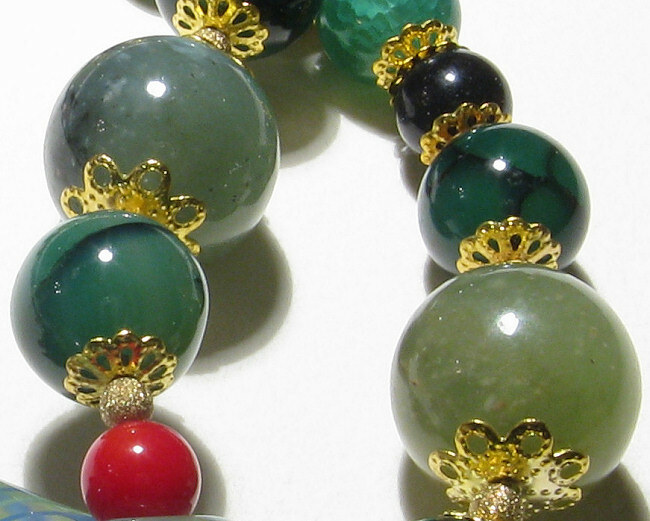 In the middle picture, the green dragon veins (teal and dark green) are visible, along with one jade bead at the top (light green) and the blue sandstone beads. 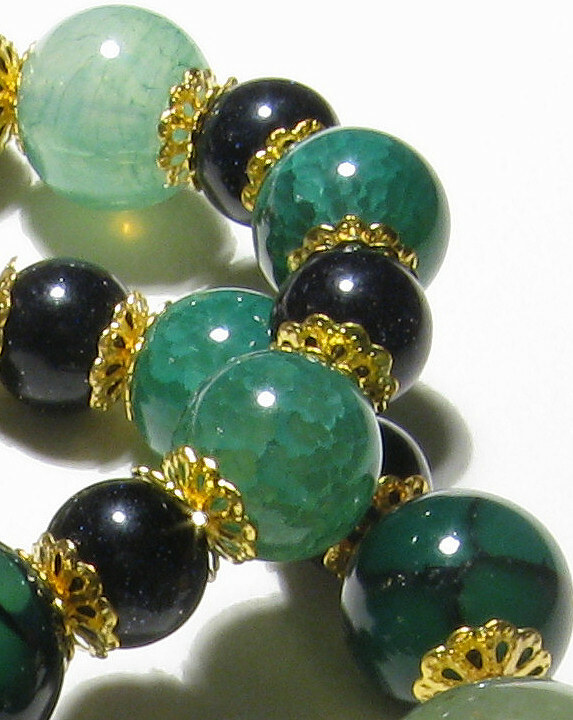 These beads have a light golden dust effect that is not quite visible in the picture, pretty much as if they were oiled and then submerged into gold/copper powder. Goldstone is actually a man-made gemstone, not natural, and produced by adding copper salts to glass, inside a furnace. These salts (copper) are responsible for its star-shine characteristic. The gold-plated bead caps can also be seen here. 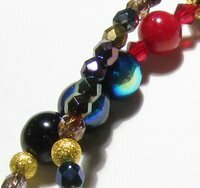 On the 3rd one, a detail of the tiny Czech fire faceted beads, and right underneath, three of the Vintage round Czech beads. The red bicones, one coral bead and some of the stardust spacers are also visible. 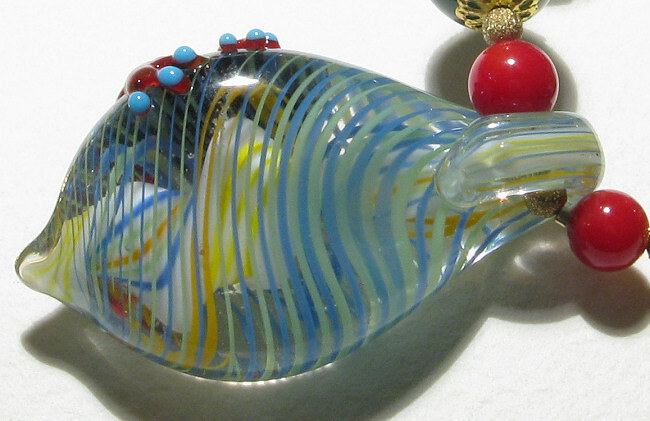 On the left, detail of the back of the lampwork pendant and two of the coral beads, along with those lovely blue toenails! And, on the right, two big jade beads and some of the others (goldstone, dragon veins, coral). On the left, we have another view of the different Czech beads I used, the small stardust spacers, coral beads and Swarovski bicones. On the right, a detail of the leafy antique gold clasp and some of the stardust spacers I used in both ends.